Make your own way to the base shop (address to be provided on voucher) along Picton waterfront at 8.30am, where you’ll meet your guide and take part in a safety briefing before boarding your boat. 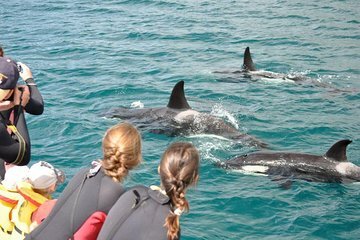 Once you understand the conservation rules and know how to act around the dolphins, it’s time to set sail across the Marlborough Sounds. Admire the dramatic scenery as you glide out around the inlets, and see if you can spot the five different species of dolphin that frequent the waters - Dusky, Bottlenose, Common, Orca, and the rare Hector's dolphins. Make the most of the on-board binoculars and wildlife cards to help you identify marine animals and sea birds along the way, and learn more about the varied wildlife of the Sounds from your knowledgeable guide. If you’re lucky, you’ll have chance to spot a school of dolphins, and get as close as possible to watch them swimming, playing, and leaping around the boat. As you watch the magnificent creatures in their natural habitat, hear fascinating facts from your guide, and learn more about the conservation rules and regulations that have been put in place to ensure their preservation. After around four hours at sea, warm up with hot drinks and cookies as you cruise back to shore, then end your tour back at Picton waterfront. Please note: We are Picton's only Dolphin Swimming and viewing operator, ensuring a personalized experience, and our Department of Conservation permits allows us to seek out and interact with all species of marine mammals that live in the Sounds.